Cold Point Village in Plymouth Meeting is sold out! Why is this good news for you? Because it’s evidence of the quality and value buyers find in the homes and communities created by Sal Paone Builders. There are currently Paone homes available other communities, and there are additional Paone communities on the drawing board. 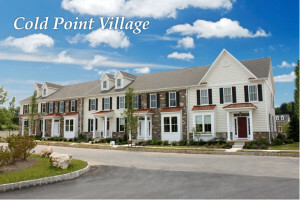 So, even if you missed out on Cold Point Village, there can still be a Paone home in your future. So what was the big attraction at Cold Point Village? These beautiful carriage homes offered a unique combination of amenities, including open floor plans, rear two-car garages and full basements. But, what homeowners seemed to love most was the ability to walk from home to the Village retail center where two restaurants, a hair salon and a dry cleaner are already open. Additional shops are in the works. Why not visit and see for yourself? While you’re here, stop into Vanguard Realty Associates. We’re located in the Village and can tell you about other Sal Paone communities.